Take your music with you in style!!!! Experience powerful, portable sound with Bluetooth boombox wireless. Bluetooth lets you wirelessly stream music from your Smartphone or tablet, while a CD drive lets you listen to your CDs or personally recorded discs. A built-in digital FM/AM stereo tuner also delivers a wide variety of music programming. Be on your toes with this incredible dual power portable boombox. The CDB23BT telescopic Antenna boombox built in Bluetooth technology allows you to stream music from your Bluetooth enabled device for unrivaled control of your listening experience. You can also listen to your favorite CDs, enjoy the AM/ FM radio without any hassle. Now you can take great sound with you anywhere you wish to. With its amazing Bluetooth connectivity and amazing blue color Aux-in boombox, can make anyone spellbound. Dual power source AC/DC makes it a perfect travel companion. Make your music mobile with portable CD player boombox. Perfect for office use, camping trips, hiking and other outdoor adventure!!! EASY TO SET UP: This portable CD boombox is easy to set up and can be paired with the Bluetooth-enabled devices of your choice. Listen to your favorite tracks in amazing quality while streaming them from your Bluetooth device or from your favorite radio station. PORTABLE: This wireless Bluetooth portable boombox delivers high fidelity audio in a compact and sturdy package that can be carried anywhere. It features both AC/ DC dual power source for the convenience of user. Enjoy your favorite tune without any hassle. Treat everyone around you to a free concert as you impenitently blast your favorite tunes from this wireless Bluetooth CD Boombox. BOX INCLUDES: Riptunes Bluetooth CD Boombox, detachable UL Plug, and Instruction Manual. 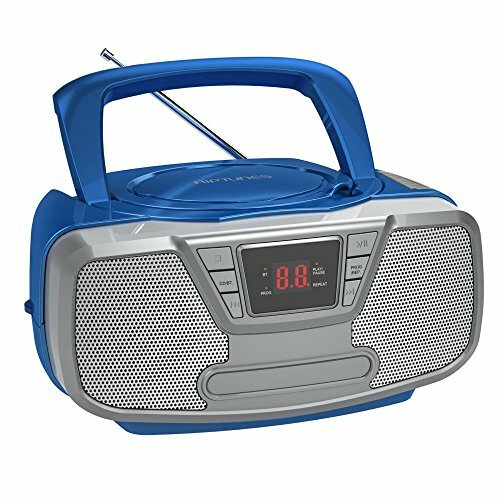 Take it along when you travel and enjoy plenty of music streaming ability of CD player boombox having amazing skip and search mechanism. Sturdy enough to take on any adventure and loud enough for your neighbors to hear - whether they like it or not. If you have any questions about this product by Riptunes, contact us by completing and submitting the form below. If you are looking for a specif part number, please include it with your message.